A perfect blend of sweet, tangy, with the slight crunch of red and green peppers, this super easy pot-in-pot meal with fluffy rice can be made together, at the same time, in your pressure cooker, saving you a couple of pots, pans and time! "Pot in Pot" or PIP cooking, is food placed in a separate (oven safe) bowl or dish and not directly set on the bottom of the pressure cooking pot. Instead, it is set on a trivet, (stainless steel steam rack) over some water. The benefits of PIP cooking are that food doesn't stick or scorch on the bottom of the pot, and you can cook multiple foods with similar cook times, in separate dishes. Glass, silicone and ceramic oven safe pots hold in heat and foods take longer to cook, so I prefer to use stainless steel or aluminum for PIP cooking. You can find a variety of bowls online that are 7" in diameter that will fit well in a 6 quart pressure cooker pot. Your local Asian Market is a great source for small cooking pots and strainers! IKEA has a 8" stainless steel bowl that fits in the 6qt pot, but is 3.5" tall and when stacked on top of the steamer basket, it was taller than the pot. When stacking 2 pots, you can use a trivet or wood chopsticks in between the layers. There is a stackable pot with locking handles that you can use. You can line your cheesecake pan or push pan with aluminum foil, to create a leak-proof bowl, like I did for this recipe. This particular recipe is using 2 'pots' or rather, one pot and one steamer basket. For cooking multiple kinds of foods at the same time, it's best to use foods that have similar cook times. You can use pre-cooked meatballs, but making your own from scratch only takes 10 minutes and is very simple. You can even make a large batch of meatballs in your pressure cooker and freeze for later use in your favorite recipes. Lean ground beef, bread crumbs, onion powder, garlic, salt and pepper. Kitchen Tip: For bread crumbs, I'll take a frozen slice of bread (usually the crust) and put it into the food processor. You can also use crushed saltine crackers, but if you do, you will want to reduce or omit the salt in the recipe. I like to add some fresh grated ginger to my meatballs for a more Asian inspired flavor. Kitchen Tip: I peel my ginger root and keep it in the freezer. Take out your frozen ginger root, use a microplane grater/zester, and you have instant fresh ginger. Once you've used fresh ginger in a recipe, you'll never go back to the powdered stuff. Try it. Mix well, using a fork or your hands. Me? Touch raw meat? Nope. I use plastic disposable gloves for that. 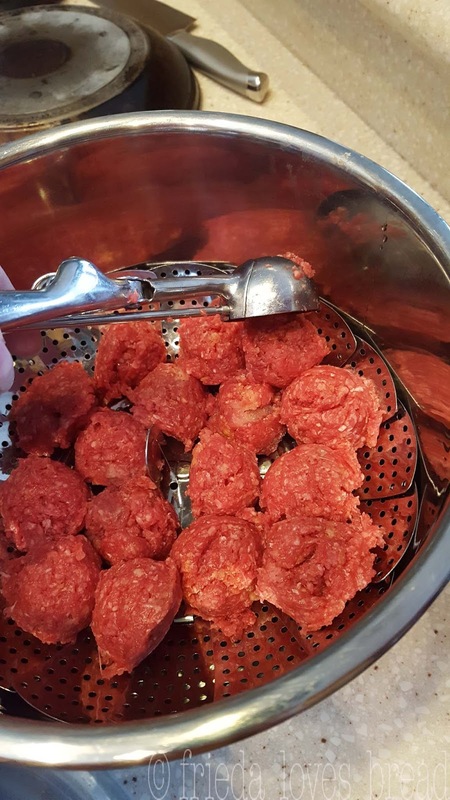 Use a 2 tablespoon cookie scoop to portion your meatballs. 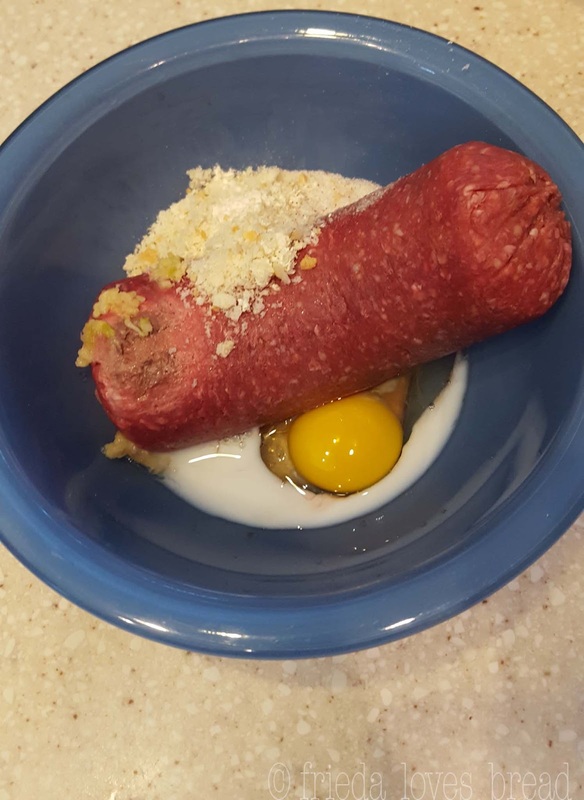 You can even take the extra step and roll the balls of meat between your hands for perfectly smooth, round meatballs. One pound of lean ground beef will make 18 meatballs. Water goes into the pressure cooker, then a lotus style steamer basket inside the pot. If you have a similar insert with drainage holes, feel free to use it. Place your meatballs in a single layer, directly on top of the steamer basket. 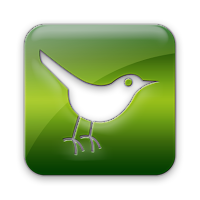 I am using Calrose rice, a short grain rice. 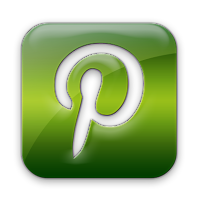 You will want to check out this site for cook times using other types of rice. You will want to keep your rice cook time as close as you can to the meatball cook time, which is 5 minutes. With the Calrose rice, I used 6 minutes with a 10 min NPR. 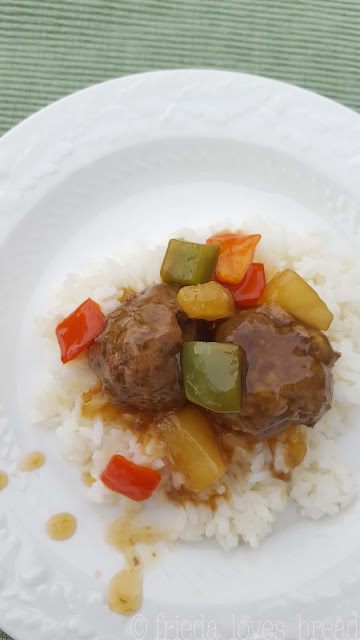 The meatballs and rice were both cooked perfectly. For the rice, you will want to rinse your rice. Why? It will be less sticky. 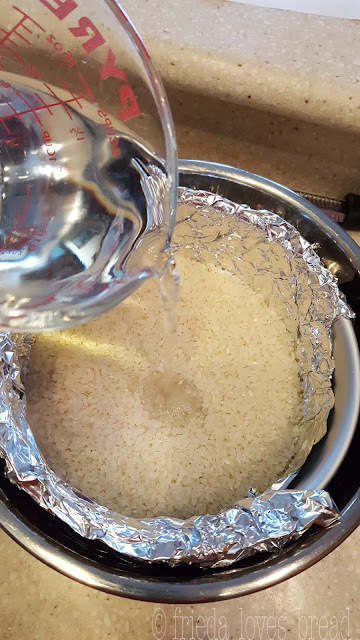 Put the rice in a metal strainer and set it over a bowl. 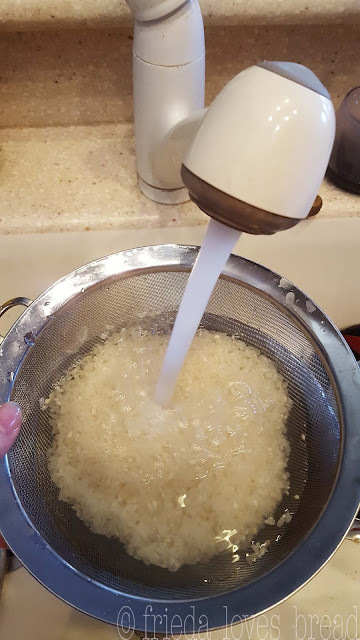 Fill with cool water, swish the rice with your fingertips, and lift the strainer to drain. Do this 3-4 times, or until the water is clear. To cook the rice, I wanted to use what I had on hand, a 7" Fat Daddio's push pan. A push pan has a removable bottom, which is perfect for removing a cake, cheesecake or lasagne, but not so great for making rice, as all the liquid would leak out. Fat Daddio's makes a 7" pan that has a solid bottom. It is only 3" tall, so it should fit along with the lotus steamer basket. I turned my push pan into a sealed pot by wrapping a single sheet of aluminum foil around the disk and setting it inside the push pan. Put the rinsed rice in your prepared pan. Set it on top of your meatballs. Cover the rice with water. You don't need to cover the rice with foil. *It is important to make sure that your pan, when stacked, is not taller than the pot. While your meatballs and rice are cooking, cut your red/green peppers and prepare your sauce. I like to cut the peppers into 1" bite sized squares. Stir together your brown sugar, cornstarch, water, rice vinegar, soy sauce, and pineapple juice. After cooking, remove your rice and meatballs. Cover to keep rice and meat to keep warm. (I stick both in the microwave). Add your sauce, pineapple and cut peppers. Use saute/normal - or the browning setting, and stir for a few minutes, until thickened. Add your meatballs. Doesn't it look great? Serve hot, over your perfect, fluffy rice. Enjoy! 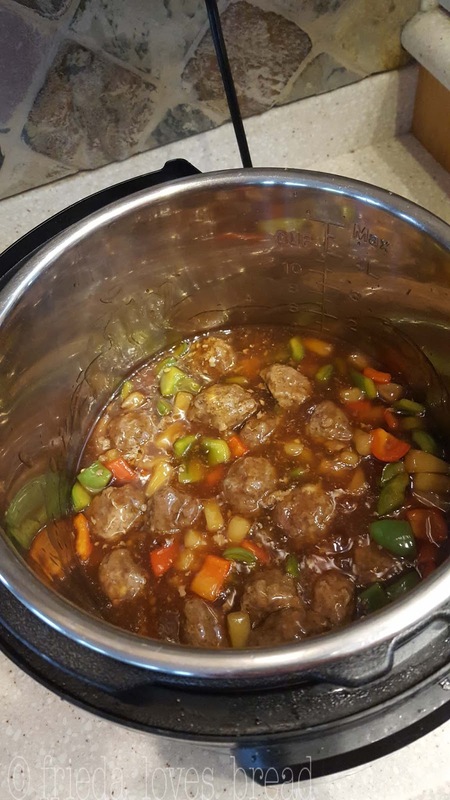 Meatballs - you can use frozen pre-cooked or make your own, cook and freeze. Mix together with a fork or by hand. Shape into 18 meatballs or use a 2T. cookie scoop. Set a lotus or similar steamer basket into the pot. Place your meatballs in a single layer. Put rice and water in a food safe stainless steel pot and set it on top of the meatballs. Put the pressure cooker lid on your cooker, and close the pressure valve or set it to Sealing. Set it for HIGH pressure and 6 minutes. When cooking time is finished, use a 10 minute natural release (NPR) by setting a timer. After the NPR, open your pressure valve and release any remaining steam. Remove the rice, meatballs, cover and set aside. While your meat & rice are cooking, prepare your sauce and cut your peppers. Cook for 2-3 minutes, or until sauce has thickened. Add meatballs, stir to coat. 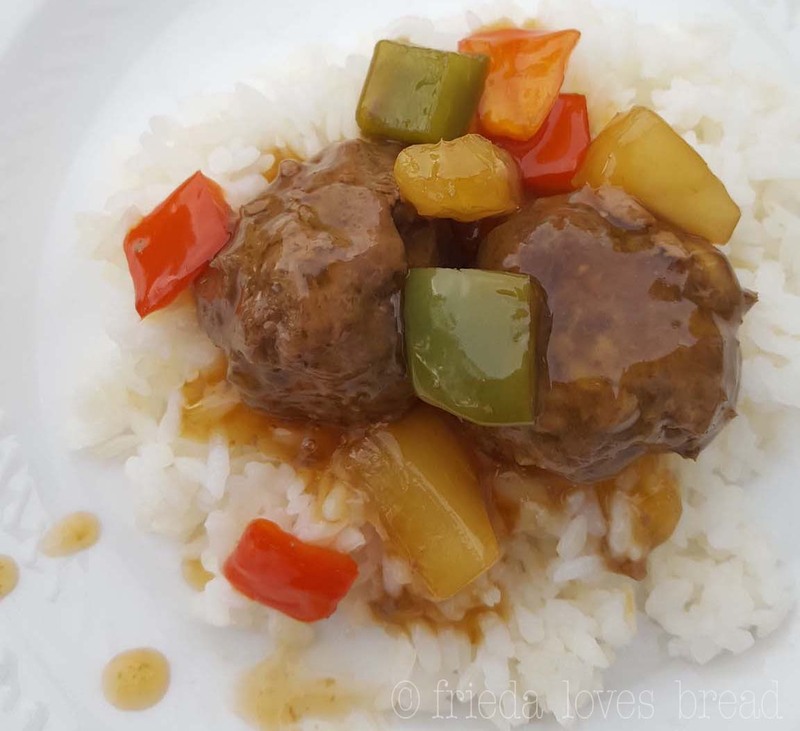 Serve your Sweet & Sour Meatballs over your cooked rice.